“Dan, can you come to San Diego?” Lucius Walker invited me to join in an action at the U.S.-Mexico border crossing to take medical and educational supplies to Cuba, which was in violation of the U.S. embargo. Just a few days before, customs officials had seized computers headed for use in church-related health clinics. So I traveled to that spot along the border and led a worship service. Then I took my first trip to Mexico, walking with an armload of artificial limbs for people in Cuba. Lucius exhibited a passion and long-term staying power that few possess. The only way social progress has been made in our country—and this is probably true in other countries—is that people challenge injustice and seek to change unjust and repressive laws … So I think that my Christian responsibility is to break unjust laws—such as the U.S. blockade against Cuba—and to call our country into an accountability for a higher level of morality. It was August 2, 1988. A ferry was carrying an educational delegation from the United States across the Rio Escondido on the Atlantic Coast of Nicaragua. Suddenly machine gun fire erupted from the forest-covered bank and raked the boat with deadly fire. Two Nicaraguans were killed. Among the 29 people wounded was the Rev. Lucius Walker from New York City. He was the leader of the delegation, the Executive Director of the Interreligious Foundation for Community Organization (IFCO) that had sponsored the trip. As he was recovering from his wounds, Walker came up with a way to strike back, consistent with his philosophy of nonviolent engagement in struggles for justice. Walker first organized the IFCO in 1967 with a broad agenda of assisting the poor in areas including education, employment, economic development, housing, health care and voter registration. But Walker soon enlarged the group’s focus from local concerns to national and international issues ranging from Native American rights to Puerto Rican self-determination. That global expansion eventually led to the Nicaragua study tour that was attacked by the Contra insurgents, a group funded by the U.S. government. Walker’s response to the attack was Pastors for Peace caravans, a new effort encouraging individuals, churches and community groups across the U.S. to aid people in Nicaragua suffering from the Contra campaign. He organized an actual caravan of trucks and buses packed with humanitarian aid. Eighteen vehicles carrying 70 tons of supplies made the first journey. In addition to the supplies, volunteers left the vehicles to help communities in Nicaragua. Shortly after the first caravan arrived, Hurricane Joan devastated Nicaragua’s Atlantic Coast. Walker quickly organized another caravan, this time with 25 trucks taking 200 tons of relief supplies. As the caravan made its way south, two trucks were dropped off in El Salvador to provide some relief in war-stricken areas. The real benefit of Walker’s idea was that countless Americans became involved in the hands-on effort to collect and transport supplies to Nicaraguans, whose stories they heard and carried back to the U.S. Walker fueled the effort by bringing key figures from Central America to the U.S. to speak at rallies in churches. In November 1992, 100 volunteers brought 15 tons of supplies—powdered milk, medicines, Bibles, bicycles and school materials—to the U.S.-Mexico border for shipment to Cuba. U.S. officials blocked their way, and CNN caught border agents assaulting a Catholic priest carrying Bibles for Cuba. The quick public response to these heavy-handed government actions prompted officials to allow the caravan to cross the border. But that was not the last confrontation. The next challenge took place in Laredo, Texas, during the summer of 1993. U.S. Treasury officials seized a yellow school bus, claiming that Castro could use it as a military vehicle. The 13 “caravanistas” on the school bus refused to get off and began a fast until it was released. For 23 days the bus sat in the Texas heat. Walker called upon the extensive network the IFCO had built up through the years of the Pastors for Peace caravans, and Washington was inundated with calls about “the little yellow school bus.” Demonstrations were held in 20 cities, and a solidarity fast was held in Havana in front of the U.S. Interests Section. The bus was finally released. It was taken across the border with the rest of the caravan, eventually making it to Cuba where it has been serving the needs of the Martin Luther King Center in Havana ever since. As of this writing, 20 Friendshipments have been made to Cuba delivering more than 2,000 tons of aid. Besides “aid caravans” to Nicaragua and El Salvador, similar caravans have traveled to Chiapas, Mexico, and to Haiti. Walker used his vision and organizing skills not only to move supplies around the world, but also to connect lives. As an African-American, he was especially committed to connecting American minorities with marginalized communities in other parts of the world, recognizing that struggles for peace and economic justice are forces that must circle the globe. While drafting Blessed are the Peacemakers, in which Walker is featured among others, I enjoyed talking with my old friend again. Sadly, he did not see the final publication. At age 80, Walker died of a heart attack at his New Jersey home in the autumn of 2010. Walker’s organization, Interreligious Foundation for Community Organization / Pastors for Peace, regularly produces YouTube videos for its Pastor for Peace YouTube channel. 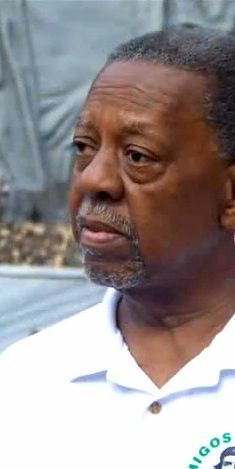 The image of Walker, above, is a still photo from the following 4-minute film, In Memory of Rev. Lucius Walker. This profile on Lucius Walker comes from the pages of my book, Blessed are the Peacemakers. Blessed are the Peacemakers is one of the three books that inspired this website. Learn more about Daniel Buttry’s series of books on global peacemakers.